Marisa Kyle draws a portrait, based on a selfie of her friend. Graphic design student Marisa Kyle tilts her head to the side before dipping a brush into watercolor paint, dabbing an already-sketched profile of her friend. Yellow strokes become an autumnal sweater. Her brush moves from the page to the palette again, where she hovers over a russet brown that eventually becomes the figure’s hair. After three years, the senior returned to illustration after a hiatus where she only worked on projects for her classes–most of which revolve around digital work, creating logos, t-shirt designs, etc. Though she’s not sure why she stopped, it partially stemmed from being burnt out from classwork. When she picked the hobby back up, she realized she really hadn’t drawn since the death of her grandmother. When you lose a huge supporter of your artwork, moving forward becomes difficult, she says. She wipes her brush clean and pauses. This part of the process is the shortest, she says. The longest is actually sketching the image out before inking the piece in defined lines. The paint comes last. The tedious nature of illustration is one she finds relaxing. The 22-year-old has dealt with depression and anxiety since she was 13, and though she doesn’t struggle as much as she used to, she still has episodes. As an artist, she says it can be difficult to produce anything during these times, but it also helps her cope. “I think that’s the reason I came back to it; I missed it,” Kyle says. It’s not often she draws men, Marisa Kyle said. She was proud of the end result. In one piece, a woman lounges in a bathtub, knees popping out of the green-tinted bath bomb water. Her elbows rest on the edges. Succulents are lined against frosted morning yellow windows (a mirror of the plants on the window sill in her own room) and a cat lounges on the milky blue tiled floor. Her eyes are closed, brown hair tousled in a messy bun. Ultimately, she says art is up to the viewer; despite her own feelings, she wants everyone to apply their thought. In terms of aesthetic and color, she tries to be versatile, but says she gravitates toward purple, blue and green hues. “As you can tell,” she replies to herself, gesturing around her small dorm, the cool-colored decor and bedsheets braced against standard beige walls. In this particular painting, she chooses the opposite: warm neutral colors popped with yellow and pink. “I catch myself calling it a style, but in actuality I don’t believe anyone has a style of art; you develop over time,” she says. A stack of her art prints sits on her dresser, sleeved in protective plastic. In several of her paintings, she makes references to Wicca: a source of inspiration for her work. 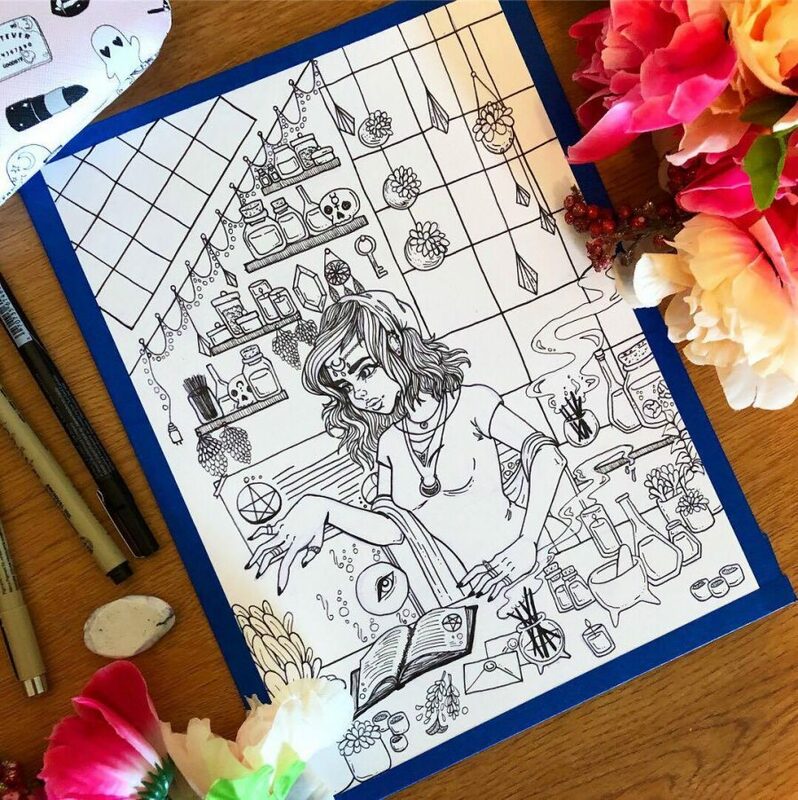 Her favorite piece, titled “Blessing,” depicts a witch in her workspace. The figure dons jewelry around her forehead, a horizontal crescent moon with three drops (a symbol of the painting’s namesake). 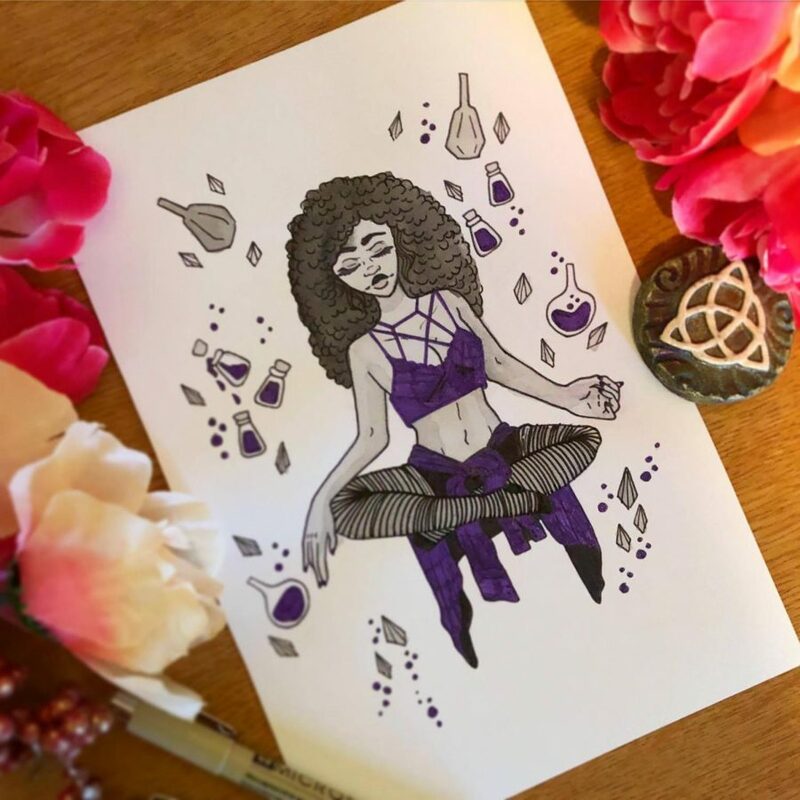 The painting is cluttered: fog from lit incense slinks across the scene, the character’s hair is held back by a vibrant green bandana that complements the green hued herbs dangling from the walls and spread across a counter, she stares down at an open book and a mystic purple orb hovers. Kyle takes pictures of her work throughout the process. "Blessing" is one her favorite personal pieces. Click to see the final result. To do well, Kyle says you need the support from other artists. NKU has given her that. So has Instagram. Kim VonHoene, fellow graphic design student, says that Kyle’s output captures a sense of personality to the characters she paints. “[Kyle] has a great attention to detail and color in her illustrations,” VonHonene says. Since the start of the summer, she’s been more active on Instagram. In October, she posted every day for #Inktober, a challenge where artists post daily spooky illustrations. By the end, she gained nearly 50 followers. In large part, she credits the NKU art community for helping her work develop into something more than it is. Dabbing a deep pink across her figure’s lips, she said that NKU wasn’t a school she considered at first, until she toured. Beyond on the purple-blue hued mood boards she creates on Pinterest, she says that seeing other artists’ pieces inspires her. Mingled with inspirational quotes and Pop figures of Walking Dead characters, posters of contemporary art hang on her wall. Kyle never had hesitations about pursuing her art as a career. The oldest of five kids, she says she was never discouraged from creating art. She’s close to her mom, who gets a first-look at pieces before Kyle uploads them to social media. “I’ll send [my mom] pictures of my work before I even post it on Instagram and I’ll get that ‘pretty’ or ‘beautiful’ that every mom does, even if they think it’s ugly or don’t approve,” Kyle says, laughing. She pauses and leans back, looking over the painting. She picks up her brush again, this time dipping it in red. She dusts it over her figure’s cheeks. She pauses again. Later, she’ll go back and draw in highlights with a gel pen. Over the summer, she also opened an online store on Society6, where followers can buy prints of her vibrant watercolor work. Set to graduate in the spring, she has no regrets in choosing art as her path. “If you love something so much, you shouldn’t be quitting it,” Kyle says. 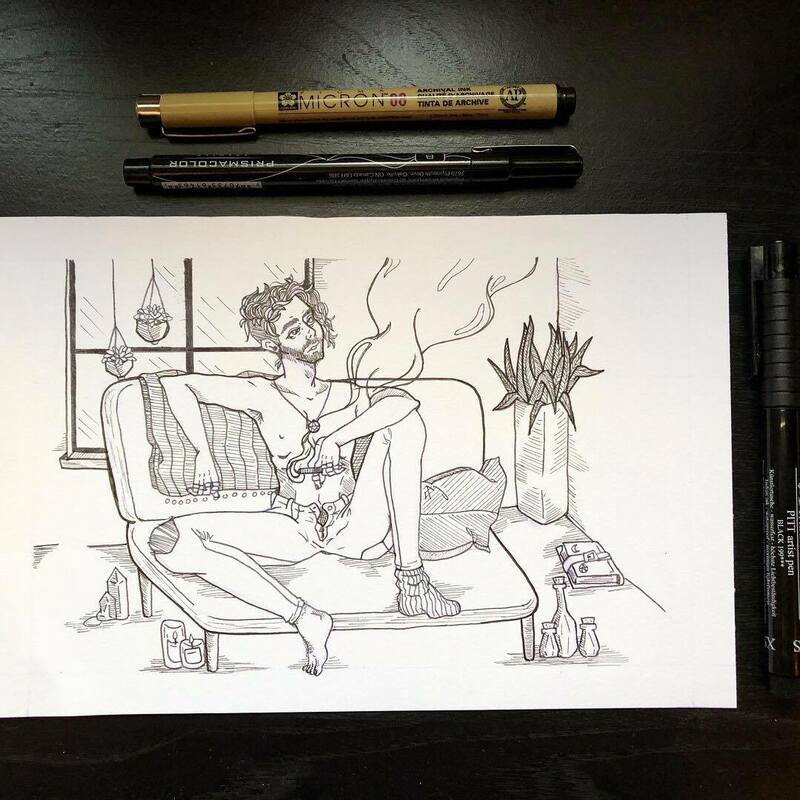 During #Inktober, Kyle sketched something for her Instagram daily.